LAFAYETTE, La. — A 21-year-old Louisiana man has been arrested in the fiery destruction of three African-American churches that occurred within a 10-day span. Police are looking into the man’s interest in “black metal” as a possible influence as it pertains to its history of torching churches. Holden Matthews, the son of a sheriff’s deputy, was taken into custody by police on Wednesday evening. Reports state that his father did not know about his son’s involvement in the crime, was deeply grieved by it, and helped to facilitate his arrest after learning that Matthews was the suspect. Matthews has now been charged with three counts of simple arson of a religious building, with each count carrying a maximum sentence of 15 years behind bars. Police are looking into Matthews’ interest in “black metal” as a possible influence behind his actions. Matthews is the lead singer of the band Vodka Vultures, and The Daily Beast reports that he was “active in pagan and black metal pages.” He also commenter under two memes pertaining to Varg Vikernes, the former bassist for the Norwegian black metal band Mayhem. “Vikernes boasted about burning churches in Norway with other black metal musicians called the ‘black circle,’ which he attributed to his desire to take ‘revenge’ on Christians and bring Norway back to its pagan roots,” Rolling Stone outlines. An acquaintance of Matthews also told BuzzFeed that the suspect had an interest in the movie “Lords of Chaos,” which centers on Norwegian black metal, and includes content about Vikernes murdering a bandmate and setting churches on fire. 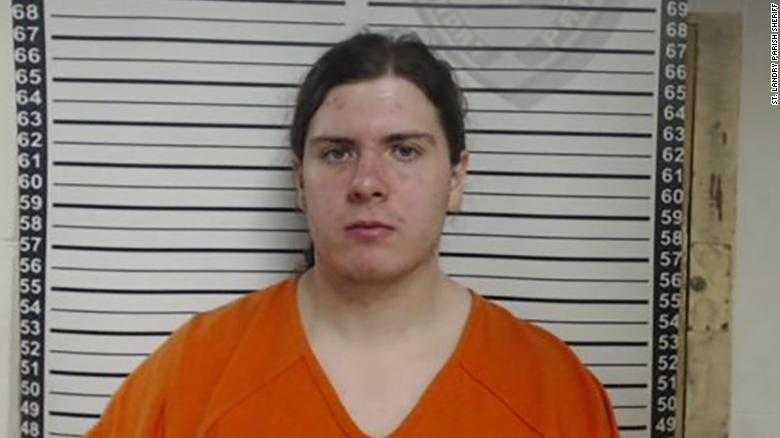 “Information investigators have uncovered, and that Matthews has offered, suggests a possible connection with a genre of music called ‘black metal’ and its associated history with church burnings in other parts of the world, which have been documented in movies and books,” Fire Marshal Butch Browning told reporters. As previously reported, the fires all occurred within St. Landry Parish, with the first being at St. Mary Baptist Church in Port Barre on March 26. Last Tuesday, April 2, the Greater Union Baptist Church in Opelousas went up in flames. On April 4, Mount Pleasant Baptist Church was similarly destroyed by fire. According to BuzzFeed, authorities found a gas can at the scene of one of the churches, and the brand name was found to be sold at Walmart. The company then discovered through its records that a customer had purchased two gas cans, a lighter and towels from the Opelousas location on March 25. The purchase was made with a debit card that was traced to Holden Matthews. A truck was also seen on surveillance footage near one of the church fires, and Matthews’ cell phone was found to be in the area of the fires when they occurred. Edwards has urged residents to pray for Matthews and his family.